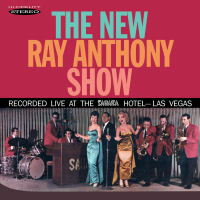 Ray Anthony led a post-war dance band which gained great success with best-selling records, movies, radio and television shows and was a top attraction in Las Vegas. With two attractive female vocalists, Diane Hall and Annita Ray, billed as "the Bookends", "The New Ray Anthony Show", was recorded at The Sahara Hotel Las Vegas in March 1960 and is represented here on tracks one to seventeen. Sepia have added four EPs as bonus tracks which feature many of Ray Anthony's popular recordings from the nineteen fifties. © 2002 - 2015 Sepia Records Ltd.